I’ve just stepped off my flight into Singapore’s Changi Airport, and as I walk off the jetway, I see a suited gent holding a placard with my name on it. I’m a little confused, but as it turns out, this is just the beginning of the attentive bespoke service that all guests of The Fullerton Hotel receive. In the space of half an hour, I’m whisked off the plane and through security, tucked into the back seat of a Benz, then pulling up the hotel’s driveway. Built in 1928, the handsome Palladian building that houses The Fullerton Hotel has been an integral part of Singaporean history for nearly 100 years. Over time, it has housed the General Post Office, The Exchange, the Chamber of Commerce, and The Singapore Club. But the building got a new lease on life in 2001, when it reopened as The Fullerton Hotel after a US$400 million restoration. Guests are greeted with towering Doric columns, soaring coffered ceilings, Italian marble floors, and a massive grand staircase that sweepings downwards from the center of the lobby. 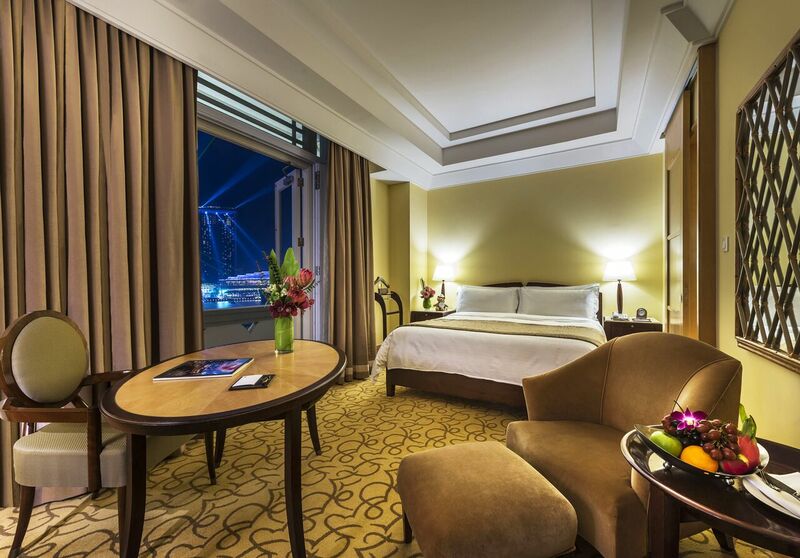 A guest room at The Fullerton Hotel. I’m quickly ushered up to my Straits Club Courtyard Room to complete check-in formalities, a premium service offered to guests who have access to the hotel’s executive lounge (more on that later). There are 400 guest rooms and suites here, and mine just happens to have an unbeatable view of Marina Bay Sands through the porte cochere outside. This, like all rooms here, is tastefully dressed in a design aesthetic that combines Singapore’s old colonial heritage and new megacity sensibilities. There are plush draperies, wood-accents, heavy furnishings and of course, a king-sized bed dressed in crisp white linen. The bathroom’s equally impressive. A spacious marble marvel featuring a shower, separate soak tub and luxe Bottega Veneta amenities. For modern-day travelers, there are expansive flatscreens, an iPad for information, services and bookings, and USB ports next to the bed. All of this with free Wifi, of course. A treatment Room at the Fullerton Spa. It’s a rather miserable day outside, with Singapore’s famous tropical rain showing up in spades. So naturally, The Fullerton Spa is the destination for the afternoon. This spacious wellness oasis is decked out with plenty of treatment rooms and facilities, but you’ll feel like you’re the only person around. 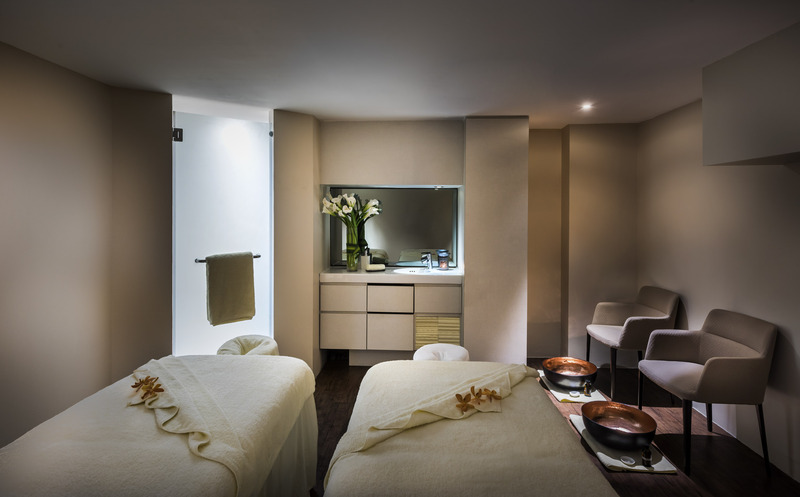 There is a long menu of treatments available, all done with award-winning products by Aromatherapy Associates. I’m booked in for the Asian Heritage Signature, one of the spa’s signature 90-minute massages. Inspired by Asian wellness, the massage combines Chinese pressure point methods with deep-tissue techniques to create a holistic experience that is uplifting and relaxation — side note: you’ll definitely fall asleep on the table. The pool deck on a sunnier day. 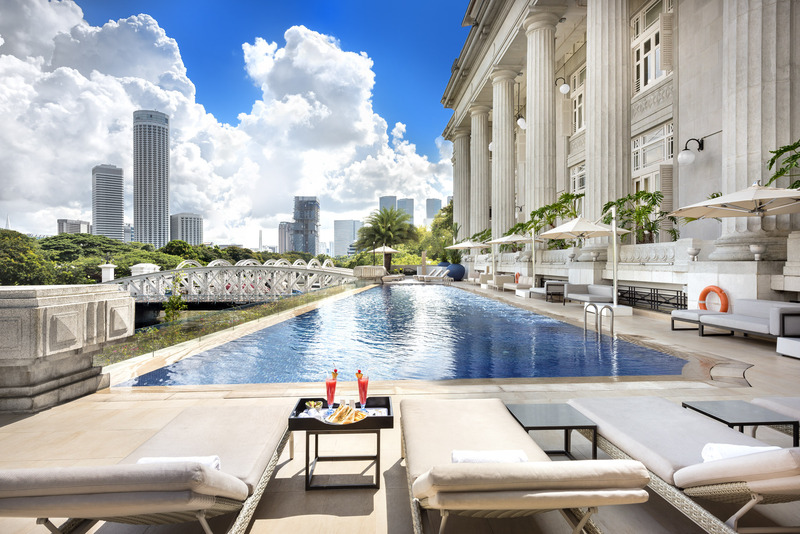 A quick wander around the rest of the spa facilities reveals a 25-meter infinity pool surrounded by sun loungers and wedged between the hotel’s stately columns and the Singapore river. Back inside, there’s a fully-equipped gym, along with a steam room and sauna to maximize your wellness retreat. The Straits Club executive lounge at The Fullerton Hotel. Suite guests — and those who book rooms with club access — also enjoy access to The Straits Club. 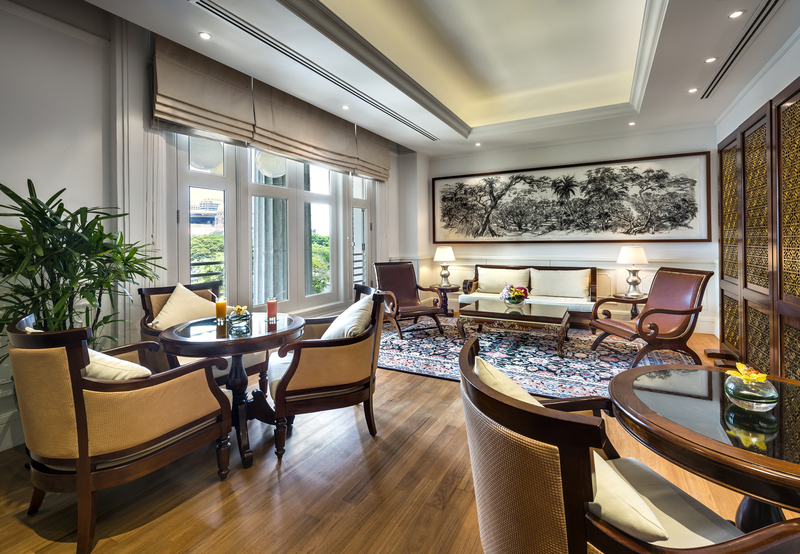 The Fullerton Hotel’s answer to the executive lounge, this quiet space is lavishly decked out in Peranakan style, with gorgeous artwork, elegant furniture and a number of useful features (think a TV lounge and meeting rooms). The best part? They dish up a Champagne buffet breakfast with hot meals made to order. In the evenings, guests gather here to enjoy the generous happy hour where unlimited drinks and snacks for two hours. There’s also laundry service and late check-out, for those that need them. 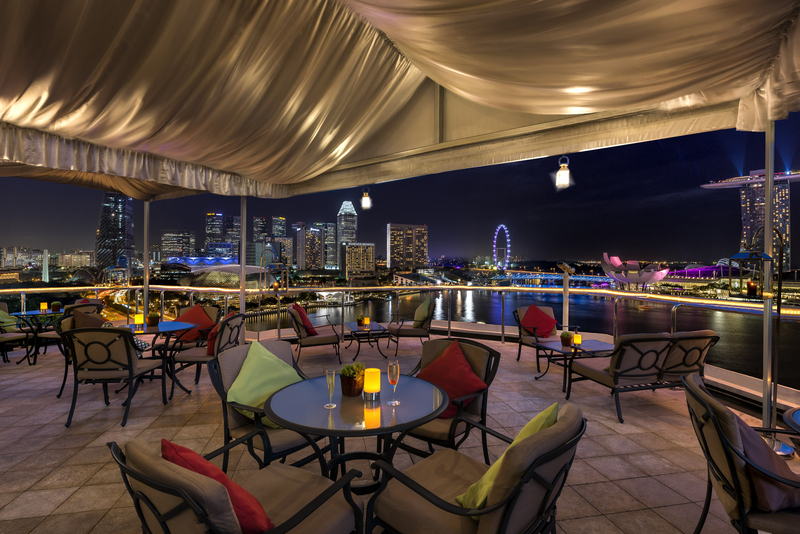 Given its prime location in the heart of Singapore, guests are spoilt for dining options. But that doesn’t mean The Fullerton Hotel skimps on its food and beverage offerings. A highlight of our stay was The Lighthouse Restaurant & Rooftop Bar which sits atop the hotel. In what was once, actually, a lighthouse, guests can now enjoy decadent Italian cuisine — and if you don’t come here to catch the sunset with an Aperol Spritz in hand, you’re doing yourself a huge disservice. For more casual meals and snacks, The Courtyard allows diners to enjoy the splendour of the hotel while enjoying a Japanese or Indian buffet, afternoon tea, or drinks —you can even try refined takes on local snacks like kueh lapis (a Peranakan cake) and teh tarik (a sweet-ishMalaysian “pulled” tea). Upstairs, Jade offers Cantonese fine-dining and two private rooms, while Town Restaurant is the top pick for the city’s powerbrokers who wheel-and-deal over power breakfasts and business lunches. Just before I check out, I slip into the Post Bar. The sophisticated spot is known for its signature Fullerton Merlion Cocktail, as well as its wines and martinis, but I was quite partial to the fact that offers an alfresco setting in the adjoining East Garden. I may have only stayed for one night, but this quick stopover was more than enough to get a strong impression of the history and grandeur of this iconic property. 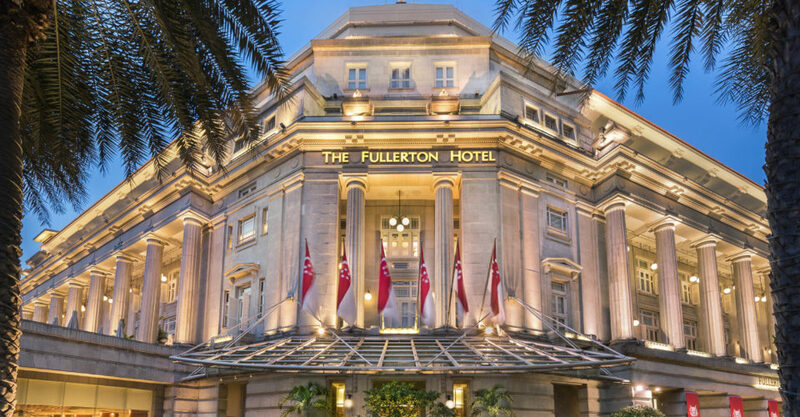 Singapore may have hotels aplenty, but few manage to combine the bespoke service, heritage and sophistication of The Fullerton Hotel. Note: The author was a guest of The Fullerton Hotel.